Is it possible to reverse Type 2 Diabetes and have normal blood sugar levels without medication? Yes! I was diagnosed with Type 2 Diabetes in March of this year and as I described before, it was a wakeup call for me to return to my regime of diet and exercise and lose half of the 20 pounds I had put on during the past 2 years. After 4 months of using diet, exercise and medication things were looking good and as my Endocrinologist described it, I had successfully controlled my diabetes with diet, exercise and medication. But I wasn’t satisfied and wanted to control my diabetes with just diet and exercise and eliminate the medication. It’s not that I’m anti-medication or some tin foil hat conspiracy theorist that thinks pharmaceutical companies are poisoning us (Claritin was a miracle drug for me and I still take one of those tiny pills almost daily). It’s just that I don’t like taking medicine when there is another alternative and being a scientist at heart who likes to perform experiments and follow the data, I wanted to give it a go and see if I could control my Diabetes with a more intense diet/exercise regime. But unfortunately I was told by my doctor that this would be impossible due to my genetics (type 2 Diabetes runs in my family) and that I should be happy with the fact that I could continue to control my blood sugar with the aid of these two pills a day. Sorry Doc, no offense, but I don’t operate like this. I’m stubborn in that regard and need to come to that conclusion on my own. I was impressed with a medical study from Newcastle University that I discovered from a comment in an earlier blog and after much research on my own I started this diet (explained here) on 26-AUG-13. The diet is not easy and consists of 3 shakes a day and 3 snacks of just the approved vegetables. No dairy, fruits, bread, alcohol, root vegetables, meat, sweets, etc. Before I get to the results of my experiment, I need to get a few things out of the way for those who aren’t familiar with Diabetes. If you aren’t familiar with the differences between Type 1 and Type 2 Diabetes then Google it first and then come back. Once you’ve done that you know that a normal person without Diabetes will maintain tight blood sugar levels between 80 and 90 (mg/dL) but a “Normal” blood sugar range is generally considered to be between 70 and 100. After a meal even a non-diabetic will see their blood sugars rise for a couple of hours to no more than 130 but then it’ll come back down to a regulated range. My Endocrinologist said that for a Type 2 diabetic he likes to see blood sugar controlled to a maximum of 150 after a meal and below 120 when fasting (a measurement taken first thing in the morning). So my determining criteria for this diet successfully controlling my Diabetes without medicine would be keeping my blood sugar measurements below 120 fasting and below 150 after a meal. But the Newcastle study made claims of reversing Type 2 diabetes (eliminating the fat around the pancreas that allowed it to produce insulin) so if I wanted to successfully reverse my Diabetes with this diet then my fasting blood sugar needed to be in the 70 – 100 range and not spike above 130 after a meal. I stopped taking my Diabetes medication (Janumet) the day before I started my diet to get it out of my system and put this diet to a true test. I stuck to the diet very religiously but on occasion I went slightly above the 800 calories per day but those calories were from the allowed vegetables and I still drank the 3 shakes every day. The Optifast shakes mentioned in the diet couldn’t be found where I live so I downloaded the nutritional information and found that the Atkins Advantage shakes matched the Optifast shakes almost identically so that is what I used. The first few days were tough and although I dropped a quick 5 pounds I still had fasting blood sugar readings at or above 120 which were no better than my measurements when I was on my medication. This was somewhat good news but there was no way I could live on 800 calories for the rest of my life. But on the 4th day something magical happened and my fasting blood sugar measurements entered the range of a non-diabetic. 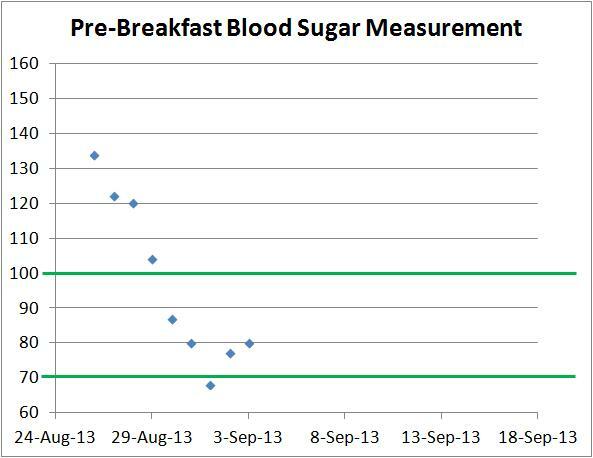 I find it best to describe this with a graph below (the green bars show the normal range for non-diabetics). My fasting blood sugar measurements were now in the range of a person without Diabetes and this is the first time that has happened even when I was on the medication! This diet worked so well that on 01-SEP-13 (after only a week on the diet) I started adding more calories from meat and eggs and my blood sugar still remained in the range typical of people without Diabetes! 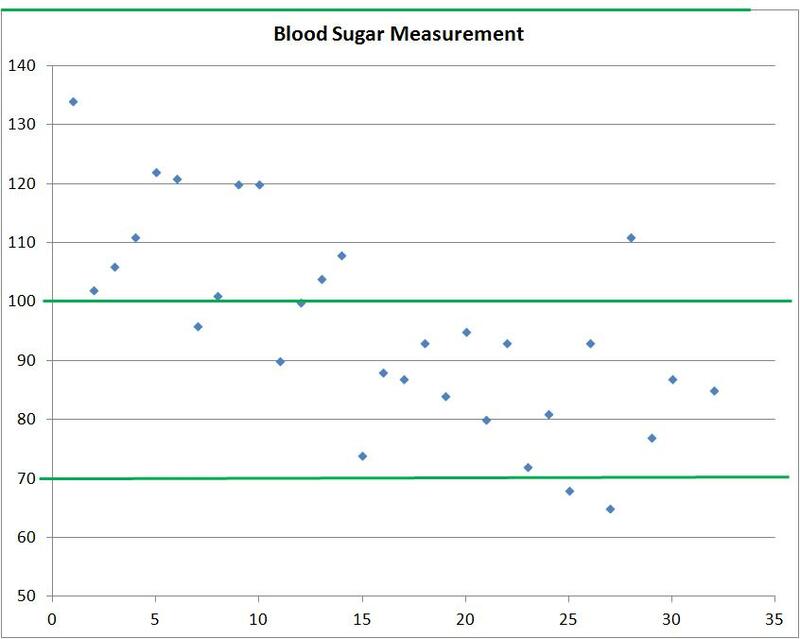 During this diet experiment I took my blood sugar measurement 4 times per day – before breakfast, before lunch, before dinner and after dinner – and the following graph shows all of these measurements. Note that the one data point above 100 was taken an hour after eating a grilled chicken salad with Raspberry Vinaigrette dressing and that caused it to spike above 100 but still within the range of a non-diabetic. I have to say that I was skeptical of this diet and thought, at best, I’d discover that only through an extremely low calorie/low carb diet did I have any hope of keeping my Diabetes in control similar to what I had with my medication (blood sugar measurements between 120 and 150) but now I am convinced that I can have blood sugar measurements equivalent to a non-diabetic while eating a modest and fulfilling diet. Now I begin the next phase of this experiment by slowly adding more foods to my diet and then measuring my blood sugar to find out what my body can and can’t tolerate. Exercise must continue to be a major part of my lifestyle and now that I’m taking in more calories I resumed my running/biking regime and will continue to do that as well as add weights to build muscle and continue to lower my body fat percentage. For those who haven’t read my previous blog entries – When I was diagnosed in March 2013 with Type 2 Diabetes my blood sugar measurements were in the mid 300’s and my A1c was 11.5 and for those not familiar, those numbers are literally suicidal. My doctor was astounded when I had brought my A1c down to 5.7 at my 4 month checkup so I can’t wait to see his reaction to my measurements at my next appointment! These results will not cause me to go back to my unhealthy ways of a year ago where I ate bread and carbs with every meal, stopped exercising and gained weight but this experiment has shown me that I can control my type 2 Diabetes without medication. I am still early on this journey and expect many more blog posts along these lines as I learn more but I feel better now than I have in 2 years and feel confident I can control my Diabetes without medication and the troublesome side effects that came along with those pills I took every day. Oh, one more thing. Over the past few months I also took medicine to control acid reflux and high blood pressure (both symptoms arrived the same time as the Diabetes symptoms) and I’ve stopped taking those medicines as well! I have not had any acid reflux issues and I take my blood pressure daily and that measurement is also in the normal range. ADDENDUM – For those interested in more of the data I took during this diet experiment and a log of what I ate you can look at this spreadsheet–> diabetes reversal. Godspeed throughout the rest of your journey!!! Thanks so much for taking the time to give me encouragement! Low carb diet and exercise (walking) is working for me too. So proud of you! Praying you will totally succeed! Would you keep documenting your meals? I think someone here might benefit. That’s a good idea. As of now, I’m really ‘off’ the original diet, only drinking a shake for breakfast and now adding lots of protein (in meat form) and getting back to around 2,000 calories. Just took my blood sugar 1 hour after eating a big salad with grilled chicken and balsamic vinaigrette and I was at 92. Still no bread for me and I tried 1 piece a few days ago and 1 hour later it was 133 so that was still ‘normal’ after a meal but that showed me what bread does to my blood sugar. I’m still keeping a log of blood sugar after meals where I add something new and I’ll keep posting on the topic. Like I said in the post above, this is the first step in a new mode of operation with regard to what I put in my mouth. thanks for the prayers and your words of encouragement here. They helped! Oh i failed to see 92. Im impressed. No meds? Omg, 300+? My patient would pass out each time she hits lower 300s, let alone 300+. How has been your reading of late? Exercise and diet will definitely help too. More power and good luck on your new regimen. My blood sugar readings in the morning are in the mid 80’s and was 91 before dinner tonight. All fasting measurements remain in the ‘normal’ range for someone without diabetes. This saturday will be 2 weeks without Janumet. Keep drinking water, and God bless you and give you good health. How are you doing 3 years later? Still doing the Paleo thing and as long as I do that, I have normal blood sugar levels without medicine. Thanks for asking Mark!